With fall and back to school just around the corner, that means everyone in my family will be much busier. It also means less time for family togetherness. My five grown children lead busy lives, and frankly so do I. While I'm sad we don't see as much of each other as we would like, when we are together we like to laugh and enjoy each other's company. So I decided that before the summer ended, we were going to have a Family Game Night. We have always loved playing games and can get pretty competitive. Our favorite thing to do after Thanksgiving dinner is to get out the board games and play for hours. I got together with my oldest daughter, her husband and children to have a game night and dinner. My youngest daughter was coming over too, though her boyfriend couldn't make it because he had to work. But she was excited to see her two nephews and her niece. We love playing Monopoly and it can get pretty funny and intense when we play. We love it, and playing games is such a great way to share family time. I went to Walmart to pick up a few things for our game night. I was trying to think of something we could all have for dinner that would be quick and easy to fix, and that we would all enjoy. Chicken nuggets, of course! My family and I love Tyson Chicken Nuggets. I love how they make getting together with family and friends at the last moment so easy, and takes the stress out of cooking. The less time we needed for cooking, the more time we would have for game playing! While I was at Walmart I had to get french fries to go with the chicken nuggets. We love them together. Our favorite brand is Ore-Ida Seasoned Crinkles. My grandsons adore french fries, and they love dipping then in ketchup. Lately they have been dipping everything in ketchup! I got a 40 oz. bottle of Heinz Ketchup to make sure there was plenty for dipping all those french fries and chicken nuggets. Everyone is here and it's time to put in the chicken nuggets and french fries. My grandsons keep asking when it will be time to eat. Luckily it won't take long. I had forgotten how hungry little boys can get! It was such a gorgeous evening that we decided to eat dinner and play Monopoly outside on the deck. We were all pretty hungry and the chicken nuggets and french fries were going fast. The boys loved dipping theirs in ketchup of course. I know the game will last much longer that the light out here, so I'm sure we will have to take it inside to finish it. We stopped playing the game while we were eating. I bought my grandsons some new play-doh to play with after dinner, and hopefully they will be happy doing that. We are trying to stretch out our beautiful weather before the rain up here in Washington begins. It is perfect weather for our Hasbro Game Night. My daughters were pretty happy eating and dipping too! If you and your family love Tyson Chicken Nuggets, Ore-Ida French Fries and Heinz Ketchup like mine does, then be sure to enter the Dip To Play Sweepstakes. 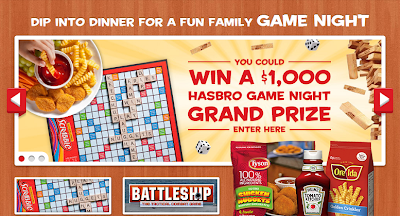 At DipToPlay.com you sign into the site and enter the UPC codes from Tyson Chicken Nuggets, Heinz Ketchup, and Ore-Ida products to unlock the games to play. We entered out UPC codes and you can too. 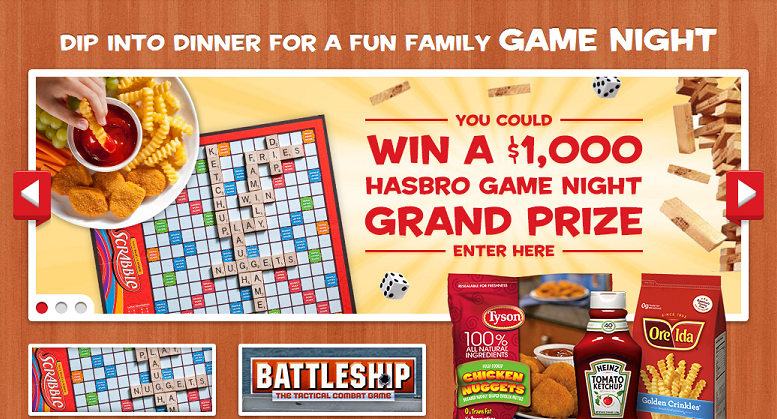 You can win a $1000 Hasbro Family Game Night or 1 of the 250 Hasbro Game Prizes. Good Luck I hope you win! You can read the official rules for the sweepstakes at DiptoPlay.com rules. To see more of the fun games available at Walmart you can read my Google+ story to see my shopping trip at Walmart. *I am a member of the Collective Bias™ Social Fabric® Community. This shop has been compensated as part of a social shopper insights study for Collective Bias™ Tyson and Heinz #CBias #SocialFabric All opinions expressed in this post are my own. Looks like you had a great evening together! This looks like a great family evening and the weather looks amazing.